The restaurant is open also if you would like to taste our cuisine. 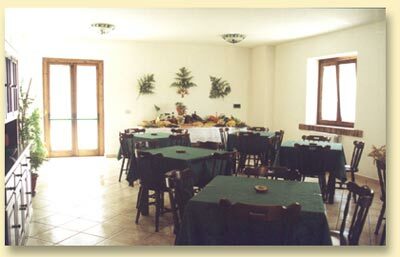 I Due Gelsi is offering fine and natural foods. Most required courses are: Fusilli al sugo di castrato (pasta with lamb sauce), Lagane e ceci (pasta with chickpeas), Fagioli e tagliolini (pasta with beans), Carni alla brace (grilled meat), Parmigiana di melanzane (aubergines with tomato sauce and cheese), Peperoni ripieni (stuffed peppers), Frutta e verdura di stagione (season's fruit and vegetable). Our pasta is always homemade. All courses are served with homemade bread and local wine.